Like OK Stupid but don't like to read? Now you can listen to OK Stupid. That's right. Download my speaking voice straight into your audio receptacles. My math wizards have put down the crack pipe for a few moments and generated this graph. 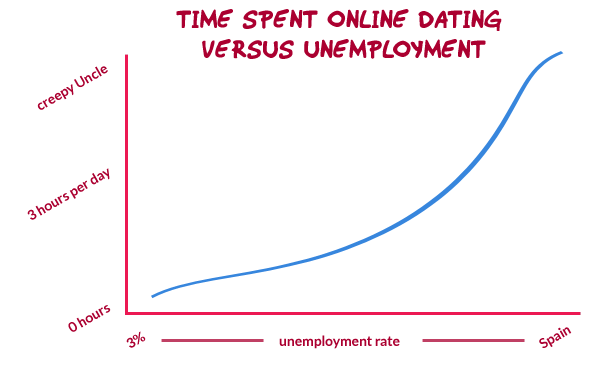 Using data from the Bureau of Labor Statistics and a phrenologic map of a stray cat I can now show the correlation between unemployment and time spent pursuing online dating. Have you been listening to, downloading, and enjoying OKStupid, the podcast? You have? Great. If you haven’t you can subscribe in iTunes or check it out on the homepage. It’s free. It’s silly. It has weird music. It has 8 episodes. Sometimes I record it without pants. That’s right, sans pants. America, what a country. Episode 4 – It’s the Internet that is creepy, not me. This concludes section 2, Matchmaking throughout human history.